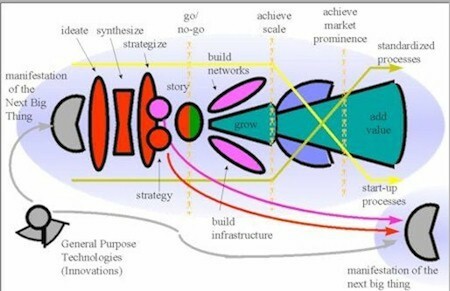 Only a decade ago, I was part of the Strategy and Innovation Core Team for a huge multinational consultancy, and writing exuberantly on my (then-new) blog about innovation and technology and how they could possibly save the world. The image below, from the Credit Suisse First Boston New Economy Forum Synthesis, describes a universal “technology development process” popular at the time. One of the leading business speakers in those heady days was Chris Christensen, author of The Innovator’s Dilemma and The Innovator’s Solution, whom I more or less idolized. And then something happened. My own research into the history of innovation and technology suggested that, rather than being the result of rigorous process, excellence and inventiveness, most enduring technologies of any value seemed to be the result of fortuitous accidents, or were the throw-away byproducts of massive, outrageously expensive military programs. Complexity science was by then throwing serious doubt on a lot of accepted theories about how change actually happens in organizations and societies. Ronald Wright’s book A Short History of Progress, and similar works by Jared Diamond and others, argued that ‘progress’ was an illusion, and that all civilizations inevitably collapse (taking the capacity to support their technologies with them). We actually likely lived healthier, happier (and often longer, when we weren’t eaten by predators) lives in prehistoric times, it seems, way back before the inventions – or more accurately discoveries – of the first great technologies (the arrowhead, fire, the wheel, and then abstract language and later, agriculture – which Richard Manning, in Against the Grain, says should more accurately be called “catastrophic agriculture”), enabling the unnatural human evolution we call “settlement”. Settlement brought with it a blizzard of new problems for technology to solve (most notably infectious and emotional diseases), and each well-intentioned new technology has produced yet more problems, arguably greater in number, size and intractability than the benefits the earlier technology provided. Nothing is new in any of this. Back in 1994, in his book Beginning Again, David Ehrenfeld described our civilization’s technological underpinning as a ragged flywheel, over-built, patched and rusty, spinning faster and faster and now beginning to rattle and moan as it inevitably comes apart. In the past decade, disillusionment with innovation and technology has grown. Christensen’s work has been largely discredited by a review, with the benefit of hindsight, suggesting that “innovative” companies don’t ultimately fare any better than those they “disrupt”. A recent study by Peter Thiel in MIT Technology Review claims “technology stalled in 1970”. As global corporate power is consolidated in fewer and fewer hands, he explains, there is less and less motivation for innovation and more wealth to buy it out and squelch it, with the help of armies of IP lawyers. My own research in recent years substantiates this claim. My greatest learning from 35 years in (and studying) organizational culture has been that size is the enemy of innovation and that most of the useful and creative things that happen in large organizations happen through workarounds by people on the front lines, in spite of, not because of, the cultural tone and processes established at the top. Looking back at hundreds of expensive strategic and change-oriented programs and projects I was involved with (including not a few that I led myself) there is almost nothing left to show for them ten, or even five, years after they were conducted. Whether we believe that innovation and technology ultimately make the world better or worse, there is now overwhelming evidence that they are unsustainable in any case. Between economic over-extension, energy over-dependence, and the ruination of our atmosphere and other environments by our civilization and its technologies, it is now almost inevitable that we will soon see a collapse that will make the Great Depression, and perhaps even the five previous great extinctions of life on Earth, look like nothing. This collapse is going to require us to live a much simpler, more local and more diverse and place-dependent life. We are destined to be very nostalgic for the good old days of modern technology as soon as it is gone, and that’s likely to happen soon. Modern technology requires cheap energy, and, notwithstanding the recent power games between the US and Russia temporarily and artificially driving down oil prices, we are quickly running out of it. Modern technology requires massive standardization and globalization, and without cheap oil, cheap foreign labour and cheap raw materials, none of which is sustainable, we cannot expect it to last much longer. A barrel of oil replaces six person-years of labour, and when those barrels become unavailable or unaffordable, the vast majority of what we all do is going to change drastically. But at least, you may insist, the Internet will survive and it will allow other technologies to continue to thrive even if they must be manufactured and operated more frugally and locally. Dmitry Orlov, as he explains in The Five Stages of Collapse, doesn’t think so, and the staggering cost and time required to keep the Internet afloat when the economy is in free-fall seems utterly unsustainable as server farms become luxury items and people’s time is diverted to living sufficiently in the real world. Likewise with other technologies we pin great hopes on for our future, or have come to take for granted: solar panels and other expensive and resource-dependent goods; the private automobile; non-emergency airplane travel; the miraculous products of the pharmaceutical and plastics industries (including synthetic fibres); industrial agriculture; the mass media, and anything that depends on a reliable and consistent electrical or communications grid. What will life look like without oil-powered technologies? It will vary hugely from one increasingly-isolated community to the next. Much will depend on the state of the land (the quality of the soil, its capacity to produce sustainable food, the proximity to abundant healthy clean water, its vulnerability to drought, floods, pandemics and natural disasters induced by climate change), the number of people in the community that must be supported, their cohesion as a community and their physical and mental health, essential skills and capacities. It will depend on our collective ability to live sufficiently, not extravagantly, and to be resilient to change. Dmitry Orlov, in Communities That Abide, says such communities need three qualities: (1) self-sufficiency, (2) able to self-organize and recover in the face of calamity, and (3) mobility: not being tied to any one place. Most modern technologies don’t fit well with such a model. Ronald Wright not only wrote the aforementioned A Short History of Progress, but also the novel, A Scientific Romance, which depicts life in the present-day UK centuries after collapse. When I read it, I was struck by how much our ancient human nature (as scavengers, more like crows than fellow mammals) comes out in his vision, and how much the world he describes resonates with the world described in Pierre Berton’s book, The Great Depression. Both books describe worlds that are accepting (or even resigned), self-supportive, full of struggle and joy, and only occasionally (and briefly and spectacularly) violent. Both books describe people initially trying to perpetuate their technologies, to make them work illogically in a world where the underlying infrastructure can no longer support them. And both books describe how people finally let go of these technologies, and free themselves from dependence on them. It is not so terrible, a world without modern technologies and the Internet. It is the world hoped for in Mark Kingwell’s The World We Want and Thomas Princen’s The Logic of Sufficiency, though it will not come about as elegantly as their authors would have hoped. Technology has always offered us false hope, and continues to do so (the latest technological “miracle” sold to us was fracking). The sooner and more gently we let go of it, and our dependence on the systems that it underlies so precariously, the sooner and more gently we can begin to make our way to a more resilient way of living. Crows, a spectacular evolutionary success both with and without us, have much to teach and show us in this regard. They have almost no technologies, and those they have discovered (e.g. the elaborate use of hooked sticks) they hold lightly, using them for non-essential, amusing tasks. They have a sophisticated sense of fun, and creatively use their leisure time joyfully and exuberantly whenever and wherever it’s available. They love, support and teach each other without expecting reciprocation. They adapt themselves to places, instead of foolishly attempting to adapt their chosen places to them. Technology’s false hope can bring us only disappointment, sorrow and suffering. It’s time to learn to let it go, gradually but starting now, and give up our dreams of “smart” technologies that are too smart for our own good. In so doing, we will embrace not progress and the wisdom of crowds, but resilience and the wisdom of crows. Well written for a luddite.